Should this be classified as "Junk" if it's a RRQ quest turn in? The best place I found to farm these is sunspring post. The scavangers have very low hit points for the silver they drop and drop powder samples nearly as often as the harder mobs. They're also much more concentrated and easier to kill than the demons in osh'gun. It may sound crazy, but after an hour and a half of grinding for powder samples on appropriate mobs and not getting a single drop I'm starting to think that these items only drop at night, since I have a bunch in the bank from when I was grinding Tailoring late at night. If you're also having trouble with grinding for powder samples, this may be the problem. It takes approx 1 hour to get 20 Oshu'gun crystals by grinding in Burning Blade Clan Ruins. On top of that you get approx 1200 Kurani rep (or "Magmar") and 50 warbeads which can be used for either more Kurani (or Magmar) or Consortium rep.
Can i turn these in even if i'm on the side of the horde ? Make sure to note that it is unique to 100. I was saving it up to turn a bunch in all at once instead of going back and forth for a lot of different turn ins and could not figure out why it was dropping for the person in my party, but not showing for me. Turns out I had 100 in the bank. So save yourself my mistake and turn them in as soon as you have 100 or before. Edit: These also give you rep + to Kurenai, 10 per kill. I tried everywhere from Warmaul Hill to inside Oshu'gun to Killsorrow Fortress, but the best drop rate I found was indeed from the Boulderfist Hunters at 62, 71 (near the quest NPC named Lump). The problem is there are only about half a dozen ogres that spawn here. Once you've killed them all, you have to wait approximately four minutes for the group to respawn. In the meantime, there are some other mobs around the area that have the potential to drop powder, such as Clefthoof and Talbuk Stag. The upside is that every time the Hunters reappear, you should get at least one or two powders per group. Another nice thing is there aren't any casters in the area and these mobs drop Obsidian Warbeads, in case if you need those (they're soulbound like the powders). I considered going to Sunspring because several people seem to like the mass pulls, but I didn't like the 3% drop rate with the Scavengers versus 12% with the Hunters. The best way to approach farming this is simply to farm something else like Primal Shadows (around Oshu'gun), Thick Clefthoof Leather (SW of Maghar) or Obsidian Warbeads* (useful for Consortium/Kurenai/Maghar rep). It's a long repetitive grind and, to be honest, you might as well make some AH money with it. Personally I've been farming these on Talbuk Thorngrazer's East of Halaa.. They have a decent drop rate and you get the talbuk meat, seeing as I have Cooking maxed and have the Spicy Hot Talbuk recipe It's a decent source of money, plus I use some for raids. Oshu'gun Crystal Powder Sample does not drop for players until level 64. I killled about two hundred ogres and elekks in Nagrand before while I was grinding out the last few bubbles of level 63, and I didn't get a single one until I hit level 64. As of 3.1 it seems that the drop rate has been increased. Confirming the drop rate at Twilight Ridge is pretty good. Great place to farm them, since you move through mobs quickly, and aldor rep items drop very frequently. I tried the Vir'aani mobs around the Oshu'gun. They got 6 groups around it and I noticed that they drop an average of 1 Oshu'gun Crystal Powder Sample per group. They have pretty low hp and spawn on their exact locations everytime, this make them easy to farm. I went to nagrand to farm Oshu'gun Crystal Powder Sample today for about 4 hours on my 80 ret pally I tried all the diffrent mobs in nagrand to find out the best thinig to farm them. It looks like most mobs have around the same drop rate to me I tried all the diffrent kind's of mobs I could find. I came to the conclusion that farming ogres is the best way to go. you get 2 kinds of rep as well as the Oshu'gun Crystal Powder Sample at the same time you get mag'har and consortium rep from warbeads. The ma'har offer you a bunch of mounts as well 8 in total + the 2 from halaa that I'm sure most of you are looking to get from Oshu'gun Crystal Powder Sample for a total of 10 mounts for farming the same mobs is most defenatly the most effeciant way to go. as far as consortium rep goes it has a couple rare enchants rare because not to many people get Consortium rep anymore. I was reveared with consortium and Mag'har before farming Oshu'gun Crystal Powder Sample x250 and now exalted with both factions 10 mounts added to my 100 mount achievement and a couple new enchants as well.I'm a miner so as i was in the ogre caves I got a lot of ore as well. Can be looted while in a raid group. I spent about 6 hours farming these for my Dark War Talbuk, over the course of time I acquired the 200 needed. I gained about 12000 rep with Kurenai farming the ogres, meaning I killed roughly 12000/11 = 1100ish ogres. I would add that Twilight Ridge is really NOT the place to go when you are like me level 67, mobs are level 71, difficult to pull because they are casters, and you cannot line of sight them properly. In addition, there are level 71 elite ogres that patroll almost everywhere. I might have loot some of the samples, but really slowly and painfully. I'm sure there are many great places to farm these, but the place I've been farming is Windyreed Village. They respawn really quickly and you don't have to compete with others that are farming Obsidian Warbeads. Does this item not drop from mobs after a certain level? I'm farming rep and trying to collect these and not getting a single drop. I also have zero to start with. I know they don't drop if I have 100, but I don't have any and they're still not dropping. I'm level 82 by the way. This powder does still drop in Cataclysm; I'm on a level 85 paladin and have been experiencing a drop rate of roughly 1 in 15 mobs dropping this powder in Nagrand. Edited to Add: I've found the best farming location to be Sunspring Village; the respawn is fast and the clumps of 1000 HP Scavengers die in one Divine Storm and are able to drop the powder. Also, the ring of mobs in the ring of stones in the camp respawns at a decent rate for AoE farming the dust. I found Sunspring not very good to farm, with the low respawn-time of the mobs and the low droprate. Out of the 'little' ones I got rarely any powder, and there are to few strong ones to farm. I went to Twilight Ridge, killing everything in sight (including the snakes and Horde players). After 2 hours of farming I got 13 Halaa Research Tokens (143 powder, but didn't hand in for the last one), 188 marks of Whats-his-name and 11 Fel Armanents. To me personally, farming the windyreeds worked really well. Boulderfist ogres respawn quite slowly, whereas the windyreeds respawn all the time; There isn't a moment when there isn't at least one Windyreed Scavenger/Wretch walking around their village. Sometimes I get a long streak of no powders, and then bam, one after the other many times. okay so like i couldnt find the npc to turn these in but i found where it can go to turn these in to , if alliance owns the halaa place then you can turn these in if horde the same just becarefull to know which side owns the small city! here is the website to know the information. Oshu'gun Crystal Powder Thank you for your time . i hope this helps . I read through all the comments here and tried all the places. They all had the same low drop rate. Thus, the best place I found is in the southeast of Nagrand, at Kil'sorrow Fortress - not because of the high drop rate, but the high concentration of guys to kill. Many times you can group them up and aoe them down. I go through the whole area, tab out for a few minutes, come back and it's respawned. Killing the whole area will usually net me 5 - 10 dust, plus greens and vendor trash. Even got a blue jewelcrafting pattern today. I'm going for the Halaa mounts, as I imagine most people are who are reading this. Good luck. Twilight ridge has been best for me. Lots of mobs grouped together, fast respawn rates. Also have looted several transmog type items. I started farming these 2 days ago, and still in the process of farming. I had better drop luck with with the mobs around the big crystal "Oshu'gun". From every 4-8 mobs i killed, i got 1. They spawn pretty fast, so if you make a fast circle sweep, you wont have to stop and wait. This may be a result of the new cross realm zoning but, I've found farming for this item is even more difficult because Nagrand is now a very busy place. However, as a level 85 BM Hunter my route between the Twilight Ridge and the 2 Forge Camps seems to yield an OK amount of dust. These places are relatively empty because questing there is limited and it accommodates for the respawn timer of the mobs. I don't claim this to be the best area but it seems to have the fewest people killing mobs. This area also wields fel armaments and marks of sageras which can help with rep grinding or even sell depending on your server. I attemped the various Ogre areas and caves but they were entirely too packed with both questers and other dust farmers. This is also the case with most any other little settlement in Nagrand. It may be worth while to attempt this sort of farming during off-peak play hours and revisit the various other reported places. Forge Camp Fear is working out very well for me. The respawn rate is crazy fast and the NPCs are very clannish. I DoT one out of a group of four and they all come rushing to my warlock. I did try a bunch of the other locations mentioned above, but the respawn rates were not as zesty as I thought they'd be, even with CRZ. Forge Camp's is so fast that I can camp some spots and kill the same NPC within seconds (ex. the overseer). By far the best drop rate and respawn time are the Gan'arg Tinkerers and the other demons around Forge Camp Hate and Forge Camp Fear. Do not waste your time on any other mobs in Nagrand. I found Twilight Ridge a best spot to farm. Take me about one hour to gather 50 crystal powders with 2 mins break during respawn cycle. While I was farming for 350 powders, I've gotten 2,000~ netherweave cloths, 600~ Mark of Sargeras, 45~ Fel Armament. I used the downtime to read comic, forum, youtube, anything. Then back wiping place clean. Tips, don't even bother to loot anything else other than those three so you won't have to make a lot of trips to the vendors/mail. 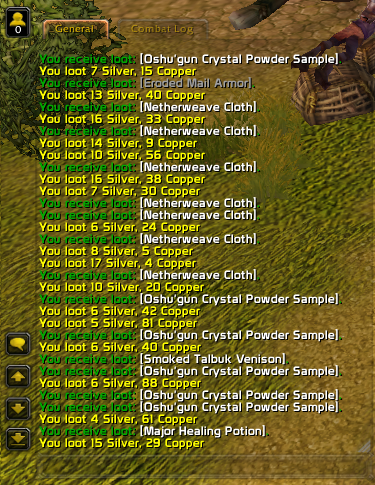 I usually hit 100 crystal powders by the time I need to empty out my bags of netherweave cloths to alt. At level 90 , Twilight Ridge pulls WAAAAY ahead, takes about a minute to clear all the mobs out and then you have 2 choices, you can circle down and wipe out forge camps fear and hate and circle back OR you can queue up in the other raids thing for ordos and/or celestials and get ported to other servers and keep clearing twilight ridge, i opt for the latter and have grinded around 45 powders in like 8 minutes. Best place to farm these is Sunspring post. I farmed 350 of these in one afternoon (around 3.5 hours). My strategy was to run in circles between Forge Camp Hate, Forge Camp Fear and Twilight Ride, averaging around 20 per cycle. To speed things up, I used a second account to zone in on a different realm and farm twice the amount of mobs. "You may turn 10 of these items in to Chief Researcher Kartos at Halaa if the Alliance have control of the base."